Many of our customers have depended on CDF for their packaging needs through the years and are familiar with our dependability—and ability to be out ahead of the curve. A responsive, forward-thinking company, we innovate when we see a need or have a transformative idea that will change the status quo—always for the better. For those of you who may not already know of our latest revolutionary product that requires no box erector, we’d like to introduce you to it: Meta® Pail KD8 with Smart Pail Inside. Meta Pail with Smart Pail Inside is a semi-rigid, vacuum-formed, plastic pail insert with a hermetically sealed peel-reseal laminated film lid, housed within an 8-sided corrugated Meta container. No box erector means no glue, simple set-up and break down, and space-saving storage! It allows you to package and ship efficiently; as well, your end customer can store, handle, minimize contamination, and recycle easily. Created with food processors, co-packers, and end-use customers in mind, it is perfect for the food industry, and so versatile it can be used for industrial uses such as adhesives.We partnered with Westrock and integrated two technologies to create one versatile solution for diverse applications. It’s such an industry-wide disruptor, it is replacing 5-gallon plastic pails! The Meta Pail KD8 is a packaging solution for semi-viscous, solid, and most liquid products that was designed specifically for low- to medium-volume producers. But there’s more—and we have videos and a brochure with all the details! The bottom line: it saves on your bottom line. 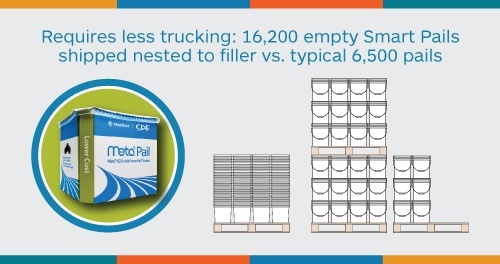 Take a closer look at how Meta Pail KD8 with Smart Pail inside is the right fit for your volume requirements—because it was designed precisely with your packaging needs in mind.